A film titled Affairs of the Heart: The Music and Life of Marjan Mozetich, produced and directed by Jamie Day Fleck, and in which I make an appearance, was given its premiere showing March 1 at the most recent edition of the Kingston Canadian Film Festival. The title of the film borrows from what is arguably Mozetich’s (b.1948) most successful composition, the violin concerto Affairs of the Heart, composed in 1997/8 for the Manitoba Chamber Orchestra and violin soloist Juliette Kang, with the support of a commission from CBC Radio Music. Filmmaker Fleck told me her story of hearing a broadcast of the concerto on CBC Radio Two while driving, and her need to remain in her car after reaching her destination in order to learn the identity of this stunning work. Mozetich says that Fleck’s story is similar to those of scores of CBC Radio listeners he’s heard from. The so-called “driveway experience” is even mentioned in the CD’s liner notes. Early in the film, Mozetich remarks, “The music I write has this kind of spatial quality to it: distance and landscape.” On his website, he also applies the term postmodern Romanticism to his style. These are characteristics that have helped to make his music immediately appealing, so much so that he has become the most frequently broadcast Canadian classical composer. But it had not always been the case. Prior to 1980, Mozetich had been struggling to conform with the aggressively modernist approach embraced by his young composer colleagues. In fact, in 1978, the year I created the CBC FM Radio network contemporary music series, Two New Hours, I chose an emphatically modernist Mozetich work, his Disturbances for solo viola – a piece we had recorded for broadcast on Two New Hours – as one of the CBC Radio submissions to the International Rostrum of Composers (IRC) in Paris. The IRC is a contemporary music meet-up sponsored by public broadcasters from some 35 countries, and organized by the International Music Council. It has been running with the participation of public broadcasters since 1954. Mozetich’s dramatically dissonant Disturbances was broadcast in several counties as a result of its presentation by our CBC delegation in 1978. He might have used this opportunity to advance his reputation as one of the emerging new voices in advanced contemporary composition. But he didn’t. Dance of the Blind was recorded and broadcast on Two New Hours in 1980. “After the national network broadcast,” Mozetich said, “there was no turning back.” It didn’t take long before many more commissions were offered. In 1981, the Canadian Electronic Ensemble (CEE), the live electronic music group I co-founded in 1971, commissioned him to compose a work called In the Garden. In the process of our working together on the composition with Mozetich, he shared some rather candid thoughts about his working process. He confessed that, as his bedtime reading material, he would bring the great Romantic orchestral scores. He read Dvořák, Mahler, Rachmaninoff and Tchaikovsky avidly. “You can learn a lot from those guys,” he remarked. He responded to our commission with a virtuosic display for electronic keyboards. The CEE members decided to digitally sequence the entire score, for both ease and accuracy of performance. The work became a core composition in the CEE’s repertoire, and was performed frequently on tour. In the course of producing that concert recording and broadcast, I had mentioned to Mozetich that his quartet, Fantasia...sul un linguaggio perduto (...on a lost language), might work well in an adaptation for string orchestra. He subsequently did just that, and his string orchestra adaptation has become one of his most performed works. Not too many years later, in 1989, CBC Records accepted my proposal to make a CD of Mozetich’s music on their Musica Viva sub-label. The CD, titled Procession, included the Amadeus Ensemble, a string ensemble led by Moshe Hammer, joined by guest soloists Joseph Petric, accordion, and harpist Erica Goodman. The recording included several important pieces in Mozetich’s developing style, such as Dance of the Blind, the string orchestra version of Fantasia... sul un linguaggio perduto, and his 1981 work for harp and strings, El Dorado. It was this latter work which revealed the special feeling that Mozetich had for the harp. As Mozetich told me: “It all started with El Dorado and my friendship with harpist Erica Goodman. It was with this work that it all gelled with me and the harp. Over the years Erica commissioned three other works with harp which have all been recorded. I think it is the unique resonance and visual allure of the harp that attracted me to it. Subsequently I wrote four quintessential harp pieces, Songs of Nymphs, that are performed by numerous harpists around the world. To date I’ve written seven works with significant harp parts.” One of those harp pieces, The Passion of Angels, actually includes two harps: Mozetich wrote the work in 1995 on a commission from CBC Radio Music, for the Edmonton Symphony Orchestra and harp soloists Nora Bumanis and Julia Shaw. All the repertoire on the CD, Affairs of the Heart, was composed during this period. Besides the violin concerto that gives the CD its title, there is the double harp concerto, The Passion of Angels, and a set of short pieces for string orchestra, Postcards from the Sky, composed in 1996. Vancouver producer Karen Wilson, who was managing the CBC Radio Orchestra at the time, had met Mozetich while serving on an arts council jury. They hit it off, became friends, and when that fateful broadcast of Affairs of the Heart created scores of “driveway experiences” and CBC switchboards lit up all over the country, she knew she would have to quickly get a proposal together for the CBC Records selection committee. The recording with the radio orchestra under Mario Bernardi, and soloists Juliette Kang, Nora Burmanis and Julia Shaw, went flawlessly, and by the summer of 2000, the CDs were being scooped up by the truckload by thousands of consumers who couldn’t get enough Mozetich into their listening lives. Randy Barnard, who was the managing director of CBC Records at the time, said: “A Canadian composition outpacing core repertoire was a rarity, never mind becoming a bestseller in the catalogue.” The original CBC Records CD has been out of stock for years, but it’s now available as Centrediscs catalogue number CD-CMCCD 21815. For ordering information, see: cmccanada.org/shop/CD-CMCCD-21815. 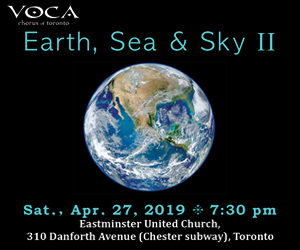 As for hearing live performances of Mozetich’s music this month, the Niagara Symphony Orchestra and music director Bradley Thachuck will perform his Postcards from the Sky on Saturday, April 27 at 7:30pm and Sunday, April 28 at 2:30pm in the recital hall in the FirstOntario Performing Arts Centre in St. Catharines.